There are some significant advantages to carrying a scooter or wheelchair in the trunk of a car. Avoiding flying road debris and weather are just the beginning. When any mobility device is loaded in the trunk of a car all of the room in the vehicle remains available. The weight of the loaded wheelchair or scooter can be substantial and when loaded in the trunk the weight is distributed over the rear axle as opposed to the bumper area at the rear of the vehicle hanging from a hitch. Without a doubt, the disadvantage of loading into a trunk is available space. Many electric wheelchairs are simply too big to fit in the trunk’s available space even with the seat folded down or removed. Only the width of the trunk opening can be considered when measuring your wheelchair to see if it will fit. The trunk opening must be wide enough to load the wheelchair or scooter, but also the post of all model boom lifts. A “boom” type lift is simply a post with a movable arm at the top such as the Ameriglide Universal Lift 400. In this example the post itself will take up 4 inches of width while loading, and must be considered when you calculate your available space. You will also notice that the seat has been removed from the base of the wheelchair in this example. Unless your trunk is exceptionally deep you should always plan on having to remove the seat on wheelchairs prior to loading. If you are capable of tilting down the base of your scooter or wheelchair while it is suspended above the opening you can gain several inches of room depending upon the width of the lip at the edge of the trunk where the weather seal usually rests. Another type of boom lift is the hitch lift. This exceptionally clever device mounts into the hitch of the vehicle, lifts the wheelchair or scooter into the air, swings over the trunk opening, lowers into the trunk, and then takes apart for easy stowing. This eliminates the otherwise necessary space that would ordinarily be required for the boom post mentioned in the previous paragraph. A good example of a scooter lift that is mounted in the cars hitch is the Harmar Micro Inside Outside Lift. Another important point to consider is hitch size. In days long past we could look at the size of an automobile and equate the size to carrying capacity. Modern vehicles can be anything from steel frame to uni-body construction, and weight distributions vary greatly. Any vehicle you plan to use will have a maximum hitch size recommendation from the manufacturer. The size of the recommended hitch opening will identify how much weight can safely be hoisted on your hitch. See our section on hitch type and size information below in this guide for more details. 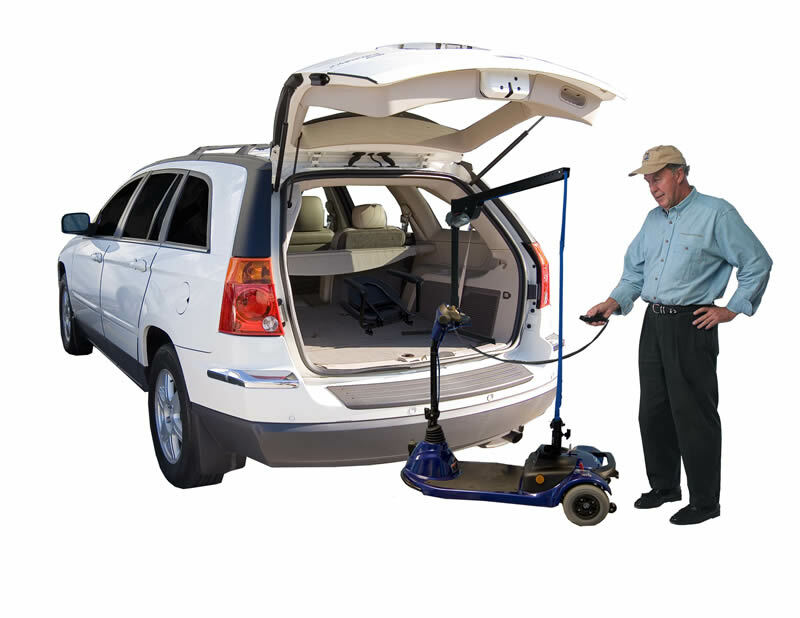 If you have a car already, or have been contemplating a new one to carry your mobility scooter or wheelchair, you should seriously consider the inside trunk lift as an option. Just remember to measure carefully and consider that you may have to remove the seat, and place it somewhere else in the vehicle. Don’t be disappointed however, if your electric wheelchair or four wheel scooter is too large to be accommodated by this type of lift option. If a trunk lift is not an option for you there are excellent solutions as described later in this guide.